DO YOU WORK FROM HOME AND FIND IT HARD TO STAY PRODUCTIVE? THESE ARE MY 3 HACKS TO STAY ON TRACK! I. START THE DAY WELL. This is key! I love the phrase “win the morning, win the day,” it’s what I try to live by - starting the day well! I always try to kick off the morning by making tea and eating breakfast, not rushing straight to the desk! I know, I know, those email notifications are so tempting to click on your phone even before you get out of bed - but try to wait! Once you have your coffee or tea, spend 20 minutes doing something life giving. I switch between reading a book, doing a quick 10 minute yoga / stretching session, and listening to a meditation podcast - or all three if I’m doing really good! Spending a little extra time in the morning pre-work is so important! Heck, grab a second cup of tea or coffee before you finally sit at your desk! Once you feel all energized and refreshed, you’ve started your day well and that energy will carry into what you do for the rest of the day! I can’t stress this point enough - GOALS. This is the first thing I do when sitting down at my desk - I create a grid for the week with each day Monday-Sunday (it’s a fun way to be creative too - make each week a new fun design). THEN, fill that grid in! Set goals for each day! I try to pick 3 main things I want to get done per day. This helps break down the overwhelming feeling of “AH I NEED TO DO ALL THESE THINGS THIS WEEK!” This way you make sure all the important things have assigned days that they WILL get done! plus, crossing off lists just feels too good! Google Calendar is my true MVP for this habit! You can really use any calendar / app for this same idea though! 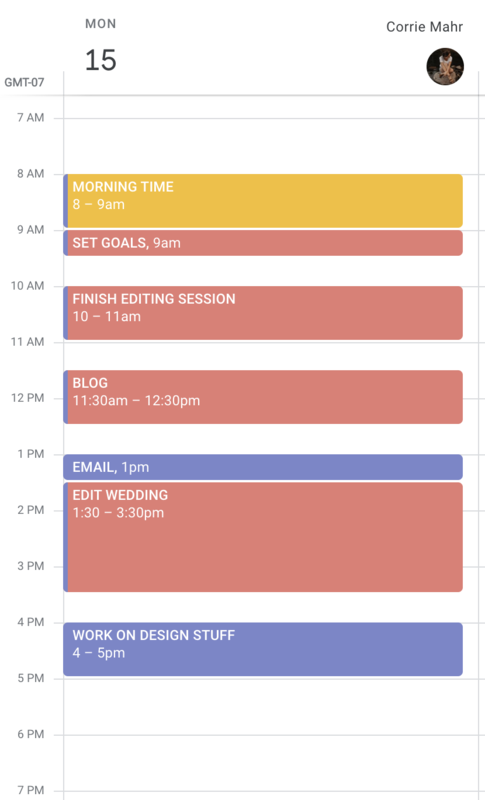 Once I have my goals for the day locked down, I set up some good old block scheduling for the day! So, this basically means I set a “time limit” for each goal + task I want to work on that day. I make sure I have breaks, but this block scheduling helps me stay on task! It keeps me focused on one thing at a time! tip: set Google map reminders on so it notifies you when your next block schedule starts! THESE ARE THE THREE MAIN WAYS I STAY FOCUSED WHILE WORKING FROM HOME! YOU CAN TOTALLY DO IT TOO!